From 1965 to present day, we are specialists in VW Wedding Car Hire to suit everyone. From the bridal car to transporting bridesmaids, best men and ushers and even your favourite wedding guests in vintage and modern style ! We can carry you all in our stunning VW wedding cars and VW campers, that are both vintage and modern. All five Wedding Cars are in absolutely stunning condition and all have fabulous onboard sound systems. 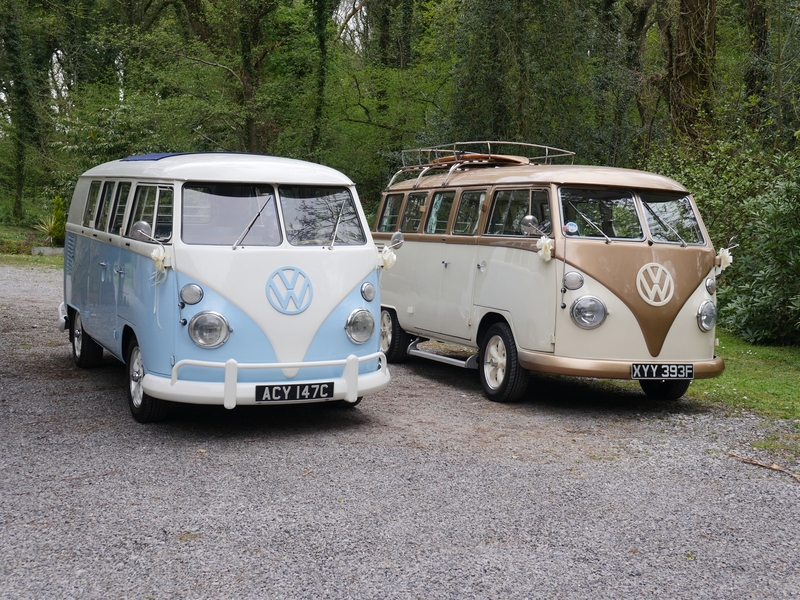 Both our VW beetles – Elvis and Cilla and Dilwyn our retro VW Campervan are painted in the same beautiful cream colour and Nancy our other campervan is a gorgeous baby blue which is proving very popular. Frances, a modern T5 8 seater Transporter is available as a great option and comes at a fantastic price for a wedding car. You can hire just one, two or all 5 of our VW Wedding Cars. The choice is yours and we will do all we can to accommodate you. You’re sure to get the most magical of wedding days where we guarantee to pull out all the stops to make your wedding the most talked about wedding ever. You may even make the local papers or TV as a few of our weddings have in the past! Dilwyn our campervan was featured on BBC3`s “Dont Tell The Bride” !